The American Bird Conservancy announced this week that it will file a lawsuit claiming the Department of the Interior broke federal laws when it drafted a regulation that eliminates punishment for killing bald eagles and golden eagles at wind turbine facilities. The administration allowed the rule change to facilitate construction of what it views as green energy facilities to combat climate change. But the American Bird Conservancy argues that the rule "undermines the nation’s longstanding commitment to conservation of eagles—unique animals that are ‘ubiquitous in U.S. culture." The conservation group says the regulation violates the National Environmental Policy Act, the Endangered Species Act, and the Bald and Golden Eagle Protection Act. "ABC will pursue legal action to address these violations and ensure that eagles, and the millions of Americans who enjoy them, obtain the legal protections to which they are entitled under U.S. law," the organization's notice read. Wind turbines have proven deadly at many facilities across the U.S. Officially the federal government attributes 85 eagle deaths to wind facilities, but some biologists have said numbers were much higher – with hundreds of eagle deaths at the Altamont Wind facility in northern California alone. In San Diego, eagle expert David Bittner was recently convicted in federal court after he failed to turn over tracking data to the federal government and was found to be operating without a license for several years. Bittner pocketed over $600,000 from the energy industry for studies concluded projects would not pose serious threats to eagles, including Tule Wind set to be built in McCain Valley, an area that other experts have long said is eagle territory. 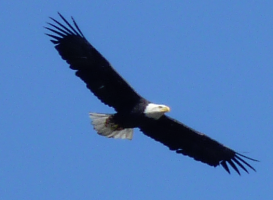 The 30-year permit allowing eagles to be killed, along with Bittner’s dubious dealings, raise serious questions about just whose interests are being protected when a wind facility is proposed – the profits of wind energy developers, or the protection of eagles--our nation’s national symbol. Encouraging. Wonder if any of the other biggies--Sierra Club, Greenpeace, Audubon Society, etc.,--will ever stop drinking the renewable Kool-Aid long enough to honestly reevaluate these environmental nightmares. Thank you American Bird Conservancy for stepping up to the plate to stop these violations of laws meant to protect Bald and Golden Eagles from being KILLED by wind turbines. There should be no "free passes" for the wind industry. Eagles deserve better. And so do us Americans who love watching them majestically soar through the air. Truly an awesome sight to behold and be protected.